So here we are, the final module. We’re now going to take everything we’ve learned over the past 5 weeks and at the end you’ll have a brand new, balanced and fulfilling schedule that’s going to get you closer to your version of success. Please note: the audio recording above doesn't feature exercise one as it's they are statements for you to write down and complete. It picks back up for exercise two! Let’s start by completing these statements. You can do this in your notebook, on your document or perhaps on a completely fresh page that you’ll keep by your desk for you to look at throughout the day and be reminded what you’ve learned. Give yourself time for this part. Don't rush. Now that we’ve gone over the whole course and you have a super clear idea on what you want, let’s build a plan of action. Answer the following questions and see what comes up. 1. What are the practical ways you can start to make a positive change in your workweek? Think about the systems and processes you learned about in the previous modules. Do you feel you could use Do, Delegate, Delete throughout your planning process? Maybe using Batch Days throughout the week would work well with your tasks? How about starting each day with the to-do list template? Think about what you believe will work for you and how you can actively start making it a part of your work week. 2. What are the essentials you’re going to make space for every single week so you can be happy, healthy and productive? How exactly are you going to do that? What do you need to do throughout your workweek to ensure you’re balanced and productive? Are you going to make sure you have white space dotted around? Are you going to make sure your tasks are all in alignment with your version of success? Think strategically here -- how are you going to make sure you stick with these essentials? 3. What are the big changes you need to make over the next 6-12 months to make your dream workweek a reality? What are the steps you’re going to take to make them happen? And what the changes you know will need a little bit of time to come to fruition? Remember that change doesn’t happen overnight. It might take some time for the lessons you’ve learned in this course to become reality, but think about the changes you’ve realised you need to make and what steps you need to take to make them happen. 4. What is the most important thing you’ve learned in this course? What has been the one lesson, piece of advice or insight that’s caught your breath? That’s made you realise you’ve been getting caught up in the ‘shoulds’ and the ‘have tos’? What are you going to do to put that lesson in place? And now, for your final exercise, I want you to download and print the weekly and monthly schedules that are available in this module. Then, I want you to take the weekly schedule, sit down and create your new workweek using the tools, tips and tricks you’ve gone over today. What will your routine be like? Will batch days feature? How many breaks will you have? This is the routine you’ll follow most weeks. Your tasks and projects might change but your working hours, your breaks, your productivity systems will stay the same. Routine is the best friend of productivity. 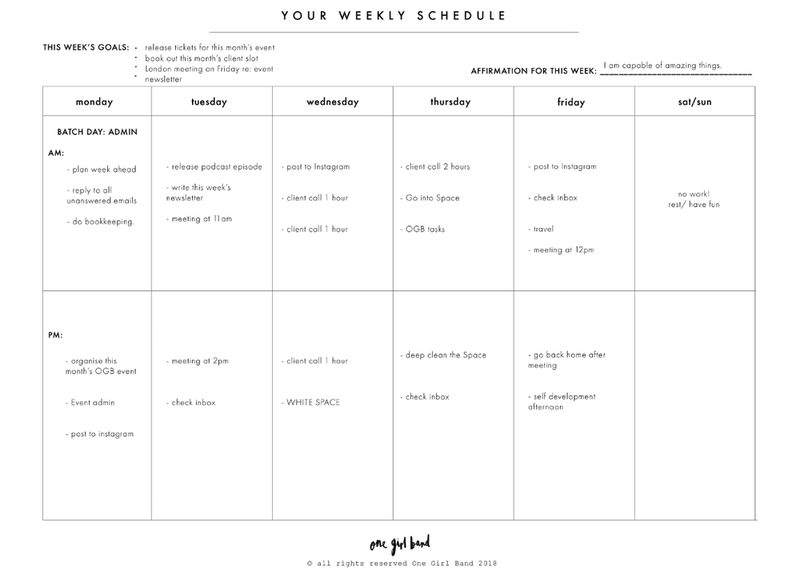 As I mentioned in Module Three, Lesson Three, use this printable to schedule out your week on a Sunday evening or Monday morning each week. Write out your tasks for the week ahead in each of the days: What you want to do in the AM and what you want to do in the PM. Breaking it up into morning and afternoon makes it seem less overwhelming as you know what you're doing before and after lunch (because you're taking time off for lunch, remember!). Again, I would recommend keeping it up to four tasks a day at most; that's two tasks in the morning and two in the afternoon, which gives you room to do your personal business as well as getting the important tasks done. If you find it easier, you can do two days at a time, and then come back to the planner when you know what direction your week is going in. There’s also space to write your goals for the week that come from your monthly goals, and a space to write an affirmation for the week (“I’m going to achieve all that I set out to do this week”). Here's an image of an example of a weekly routine. Then, grab your monthly schedule and plan the next month. Just one at first. What weekly tasks do you need to do in order to achieve your monthly goal? What tasks do you need to do over the next month to help reach your big quarterly goal? 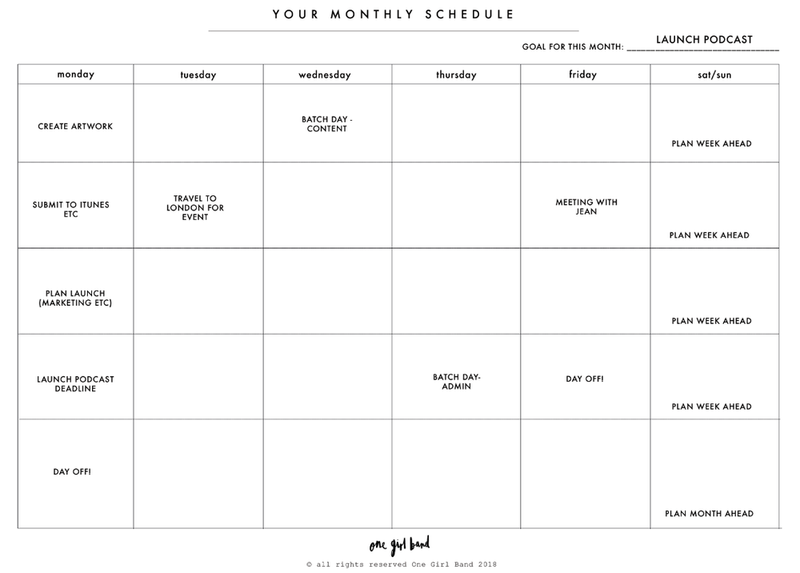 Your monthly schedule isn't a place to put your daily actions like you do in your to-do list or weekly schedule above- it's purpose is so you can see clearly what you need to plan into your week and days, what special events you've got coming up, any deadlines for projects etc and days off. You'll see in the example below I've used the Podcast goal from module 2 and have put the weekly actions on each Monday of the month. This doesn't mean that task has to be completed on the Monday (although that would save you from worrying about it all week!) but it can be stretched across that week. Keep it all in mind, listen to your gut, and don’t let guilt, your inner critic or outside influences get a word in edgeways. The thing is with scheduling is that it isn't a 'one-size-fits-all' job. I can't tell you exactly what to schedule because I don't know your responsibilities, your circumstances or your home life. The only thing I can give you is the tools and resources to make the best decision for you (and hopefully, that's what i've done throughout this course!). Now, we're not quite done yet! Click below to read my final note.